It’s late-winter 2019 and the Gallatin is covered in a snowy mantle, making it easy to forget last summer’s miles long, neon-green algal bloom and the reality that big water issues are looming in Big Sky, MT. For years UM Waterkeeper has bird-dogged infrastructure planning from the Big Sky Water & Sewer District, the largest provider of wastewater services in greater Big Sky, and particularly the terrible concept of piping wastewater directly into the Gallatin River. We are happy to report that the District recently agreed to consider a novel approach to solving its wastewater disposal challenge: indirect potable re-use. As we’ve written previously a leading dilemma for Big Sky and the District is the pace of growth and the limited capacity of safe wastewater disposal. Until recently the District would receive, annually, 150-180 million gallons of wastewater, the majority during the winter, and would treat and store wastes in ponds spread throughout Big Sky. During warm summer months the treated wastewater can be land applied as irrigation water on golf courses and in purple pipe projects. With record growth and visitation the problem is that the status quo of summer land application simply can’t handle the volumes expected over the near future. This constant development pressure, and lack of disposal capacity, is why the nasty proposal to discharge wastewater into the Gallatin once again reared its ugly head. Because the District recently brought online 10-15 mg more storage via Spanish Peaks, and because the Yellowstone Club will begin storing and disposing of > 100 mg of wastewater annually per its contract with the District, everyone’s gained a bit of proverbial breathing room. Thankfully, the District agreed to use this breather mindfully and examine, through a fate-and-transport study, the viability of creating an indirect potable re-use system in the Big Sky Meadow Area. 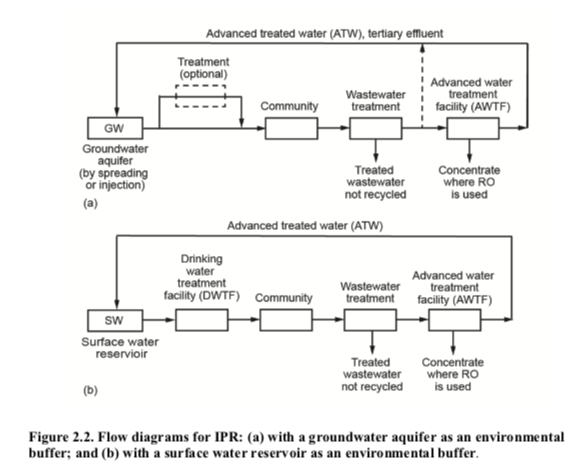 For those not familiar with Indirect Potable Reuse (IPR), IPR is an innovative approach to re-using highly-treated wastewater and is used on much larger scales in urban areas with finite water supplies (such as Southern California). Generally speaking, in an IPR model effluent is introduced into an environmental buffer (e.g., a groundwater basin) before being withdrawn for potable purposes. The environmental buffer provides storage, transport, and in some cases an additional barrier for the protection of public health. In groundwater augmentation, treated effluent can be applied by spreading or direct injection, whereas tertiary effluent is applied by spreading to take advantage of soil aquifer treatment. 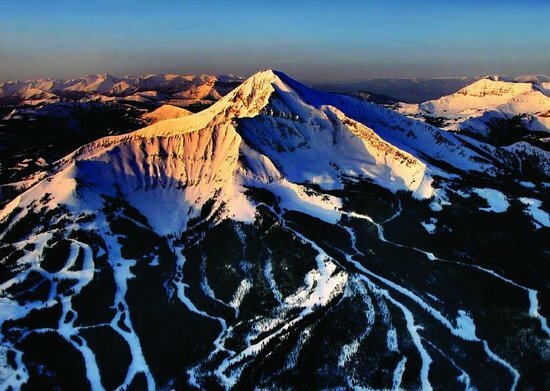 The possibility of IPR in Big Sky is very exciting, both because the planned MBR treatment plant upgrade could be used, alongside other technologies, to create the high-quality effluent IPR relies upon, and because IPR could help address Big Sky’s other water challenge: finite water rights! Put simply, there are no “new” sources of water supplies available in Big Sky for future use; everything is already allocated. This legal water rights reality means innovative approaches are needed that can turn a liability – such as wastewater – into an asset – new water sources. IPR could be a way to both protect downstream rivers from pollution while meeting upstream domestic and commercial use needs; the first step – and moment worthy of celebration – is the District’s decision to officially analyze whether IPR can work in Big Sky. In December 2018 we reviewed a few interesting land use proposals that drew a couple red flags. First, we found an application for a Conditional Use Permit to change a land use activity, which is required in Gallatin County when a proposed activity deviates from the traditionally allowed activity. 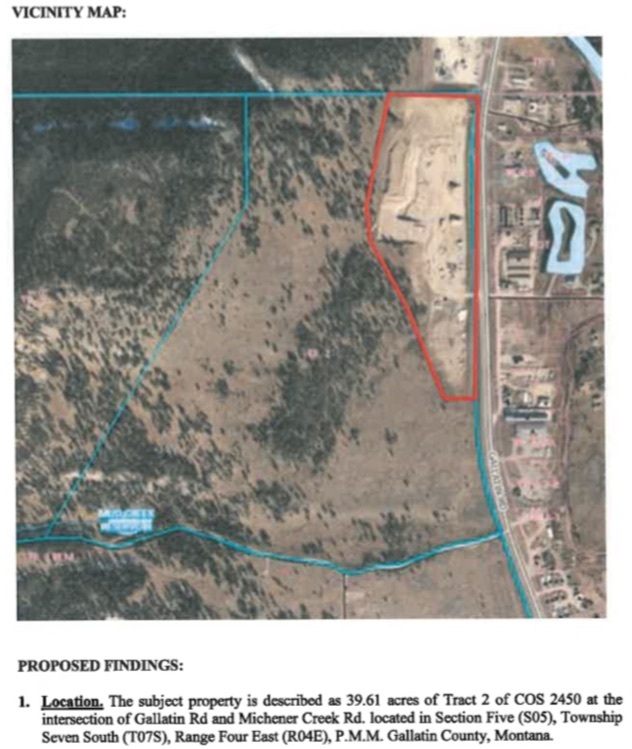 The CUP in question was for development on the longstanding gravel pit directly off Hwy 191 in Big Sky’s Canyon, allowing a portion of the pit’s untouched land be converted to single-family zoning adjacent to a larger portion (requested for the same zoning change, discussed below). Second, we saw a Zoning Map Amendment proposed from the same developer. A Zoning Map Amendment is a more permanent form of transitioning a land use from the previously determined land use pattern. This particular proposal requested a map amendment to allow more dense development; specifically, to convert a zoning designation of RC-SF-5 to Residential Cluster Single Family One (RC-SF-1) (totaling 128.62 ac), and to convert an adjacent parcel from Commercial-Industrial to RC-SF-1 (6.89 ac). The old zoning would only allow 35 lots; the new change would allow 175 lots. Third, we saw a Zoning Text Amendment Change proposed from the same developer. A text change is used to change the specific language of a zoning rule which, depending on what term is changed, could significantly alter the application of zoning rules. This too drew a red flag because changes to definitions, in the world of environmental law, often occur when a proponent knows their operation/activity won’t be allowed and therefore seeks to change the rules of the game to allow the proposal to move forward legally. Think of it as a game of chess; a very high-stakes game of chess. We have several concerns with the Big Sky Rock LLC proposals. First is contextual: everyone and their Mother knows Big Sky development is all about, in the end, profits. No one develops land for free, and no proposed development in Big Sky – whether the old gravel pit by the highway or a subdivided ranch upstream – is intended solely for “the public good.” The three applications noted above are all framed in their applications as part of the effort to make affordable housing possible in Big Sky. What’s troubling is that there is zero discussion of how the proposed actions alone will create affordable housing without any mandatory deed restrictions or covenants. In fact, the very Zoning Text language proposed for change is in one instance about allowing “hotels” in addition to “motels;” if you think this amendment is innocent and not intended to pave the way for intense, large-scale housing operations, I have a bridge in Brooklyn to sell ya. It is highly disingenuous to talk about the proposed development as allegedly in the public interest for affordable housing (and believe us, that is exactly how the proposal was framed in public testimony to the County Planning Board) without any discussion or commitment of proven legal requirements on development that would ensure such property is actually affordable – and used by – folks who are median income and work/live in Big Sky. The Second concern is substantive: taken together, the zone text amendment allowing big commercial development, the zone plat change allowing 1 ac vs. 5 ac lots, and the CUP allowing 7 ac of commercial land be zoned 1 ac lots, all mean a big change in land use in Big Sky’s Canyon is being proposed, and as a practical matter it will mean huge new demand for potable water and huge new inputs of wastewater and stormwater in a region challenged by existing pollution and sensitive waterways. Let’s make the development more tangible: presently these lands are undeveloped. Current Gallatin County Zoning requires sparse development and little density to preserve the wild character and protect local environmental resources. Now, the requested changes would sanction the exact opposite: new hotels and at least 175 homes/condos. The problem isn’t necessarily density per se; generally speaking in wild environments density is a good thing because it concentrates impacts and, if designed with proper mitigation, can have very little env’t impact while providing beneficial tax dollars to otherwise rural communities. 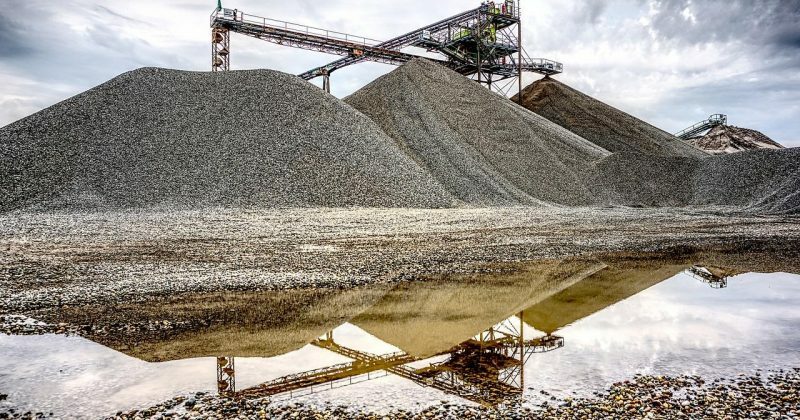 A main problem with the Gravel Pit Project is that indirect consequences of this proposal are not being discussed at all: e.g., what about infrastructure and what happens with water pollution that the landscape developments seem to inevitably entail? We asked just this question at the public hearing and requested the zoning board not act on any proposals until there was a discussion of wastewater and stormwater management plans. The Board however said those issues were the prerogative of the County Sanitarian (which oversees septic) and MT DEQ (which oversees water and land pollution controls), and it wouldn’t stop the proposals from moving forward. In our opinion the Board’s faith in those two institutions is sorely misplaced given the poor track record of development proactively taking care to protect local water and land resources in the Gallatin Valley or Big Sky proper. The Board, and Gallatin CO Commissioners, have the legal right and authority to require more diligence and planning up-front to responsibly manage water pollution; it should do so here! Another large part of our concern with the Gravel Pit Proposal is the reality that it sits, geographically, less than a 1/2 mile from the Gallatin River. Equally important is the fact that Montana resource agencies already know groundwater, which runs underneath the proposed development parcel, is hydrologically connected to the Gallatin. This means any type of wastewater (or surface water pollution) in the parcel will most certainly end up causing or contributing to water quality pollution in the Gallatin. 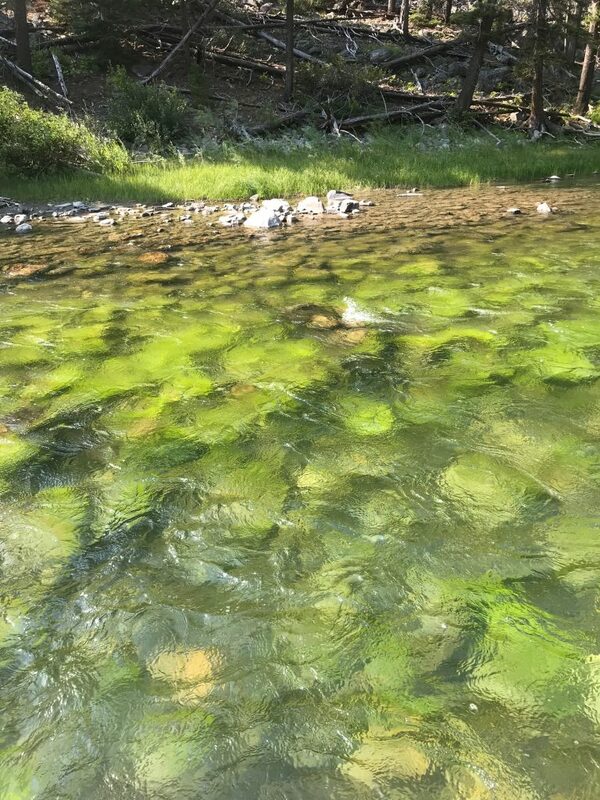 This concern is all the more pressing because the Gallatin River experienced a miles-long neon green algal bloom in August 2018, caused by unhealthy and unnatural nutrient loading (which comes from poorly controlled development wastewater). Allowing more development without taking steps to ensure no new pollution to our local streams and rivers occurs represents poor decisionmaking that is both manifestly unjust and dangerously short-sighted. Remember this neon green event last year? To be clear, poorly controlled development and a lack of proper wastewater control directly contributes and causes these types of algal blooms. The known threat unregulated wastewater and stormwater pollutions poses to the Gallatin means our local decisionmakers at the County level and DEQ need to pump the brakes and get a handle on how, if at all, the proposed Gravel Pit Project development can control its negative impacts on local water resources, before entitlements are granted and mitigation – instead of prevention – becomes the name of the game.